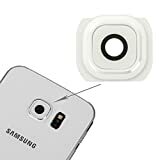 If your Samsung Galaxy S6 camera frame has been damaged from everyday use or accidental drops, then the Samsung Galaxy S6 replacement camera frame is just what you need to help you make your device new again. All spare parts are tested by the manufacturer before they are sent out for quality control and inspection. Due to the cost of phone a DIY fit is NOT recommended, please get this fitted by a professional if you are unsure. Please ensure you are able to fit the spare parts as we will not accept returns if damaged during the fitting process, all our products are securely marked. If you are not confident in fitting this part on yourself then please seek assistance from a professional in order to avoid unnecessary losses. We do not provide instructions with the item, if you are unfamiliar on fitting the replacement screen, we recommend you to view a Tutorial on YouTube to see exactly what is involved in replacing the part. This entry was posted in Discount Photography and tagged Camera, Cover, Frame, G920, Galaxy, lens, Part, Replacement, Samsung, Spare, White by Ball Photo. Bookmark the permalink.